On 16 September, police broke up an academic discussion at the offices of renowned activist NGO the Jakarta Legal Aid Foundation (LBH). The topic was the killings of alleged leftists in 1965 and 1966 in the wake of the failed coup that brought former president Suharto to power, public discussion of which has often raised the ire of anti-communist mobs. This event was more significant than it seems at first glance. LBH has always been critical of the government and unafraid to address highly controversial issues. Despite this, security forces have never before broken up a meeting at its offices — not even under Suharto’s authoritarian ‘New Order’, when LBH was often the most vocal opposition voice in the country. The trouble started when protesters, including Islamist groups such as the Islamic Defenders Front (FPI) gathered outside LBH, claiming the meeting supported communism. As is so often the case, the police gave in to the mob. They surrounded LBH, forced their way in and closed the event down. Discussion of the 1965–1966 mass killing or imprisonment of Indonesians supposedly associated with the Indonesian Communist Party (PKI) may still be controversial in Indonesia, but it is hardly novel. There have been many similar events in recent years (including at LBH) and even public conferences, some of which have been endorsed by the government. And every Thursday, survivors of the massacres and their supporters protest outside the Presidential Palace to remind President Joko Widodo (Jokowi) of his broken election promise to resolve past human rights violations, including the 1965-6 massacres. The idea that communism might be resurgent is ridiculous in a country that doesn’t even have a leftist political party. Although the PKI was violently obliterated in the mid-60s and communism is a dead letter globally with no popular support in Indonesia, it is alive and well as Indonesia’s number one bogeyman. Jokowi helped legitimize this in May, responding to claims that he is from a former PKI family by calling for communism to be ‘crushed’ if it rose again. Communism remains the label of choice to smear progressive opponents, as Islamist groups showed in their highly effective attack on LBH. Civil society leaders like those at LBH are, in fact, the intellectual engine of the reform movement that delivered democratization in the years immediately following Suharto’s resignation in 1998. The attacks on LBH are another marker of what they see as Indonesia’s slow slide away from liberal democratic reform, towards what they are now calling the ‘Neo-New Order’. Civil society figures such as Nurkholis Hidayat, the former director of LBH Jakarta, point to a series of disturbing events suggesting a trend towards authoritarianism or, as they call it with a heavy dose of hyperbole, a ‘democratic emergency’. Typical examples are the government’s failure to resolve past human rights abuses, the increasing use of bogus criminal charges to silence critics of the government and anti-corruption activists, and the increasing extra-judicial killings of drug suspects. A more recent example is the controversial emergency law (Perppu) on mass organisations that will allow the government to ban civil society groups (such as LBH) without going through court. They also point to an increasing number of military tough guys in the Jokowi administration, including Wiranto, Ryamizard Ryacudu, and Gatot Nurmantyo, who feed paranoia about the rise of communism using Suharto-era rhetoric. In short, civil society is losing faith in Jokowi as he follows global politics further to the right. He is not in an enviable position — he is an outsider and a weak president, who has less institutional support than most of his predecessors. He is not a former general like Suharto or Susilo Bambang Yudhoyono (SBY), or the head of his party, like Megawati Soekarnoputri or B J Habibie. He does not even have a major popular organisation behind him, as did Abdurrahman Wahid. And he faces an array of wicked problems. He is under great pressure from the kind of aggressive Islamist politics that targeted LBH. Earlier this year, they forced the jailing of his close friend Basuki Tjahaja Purnama (Ahok), the former governor of Jakarta, and they have tried to smear Jokowi as a ‘closet Christian’, as well as a ‘covert communist’. Jokowi also has to deal with the continued dominance of powerful oligarchs, who control political parties, most of the media and, some claim, more than 60 per cent of the economy. He cannot afford to alienate them, and that means there is not much Jokowi can do about Indonesia’s poorly-regulated political system, which favours the wealthy and drives candidates to illegally recoup the high costs of getting elected once they are in office. This system has entrenched corruption among the political elite and is a key reason for their predatory approach to public procurement. All of this feeds into Indonesia’s poor reputation for transparency, which, in turn, keeps foreign investment away, despite Jokowi’s constant rhetoric that Indonesia is ‘open for business’. That, combined with persistent low tax revenues and red tape, has seen economic growth stagnate at 5.2 per cent, well below what is needed. The resulting high prices and lack of new jobs feed discontent. With elections ahead in 2019, Jokowi knows he has to cater to Islamist rabble-rousing and keep the oligarchs happy in order to convince the public that he should be re-elected — all while somehow keeping the police, army and Megawati’s conservative nationalist political party (the PDI-P) on side. In these circumstances, Jokowi probably feels he has little choice but to dump many of his promises to civil society, which is becoming increasingly marginalised. 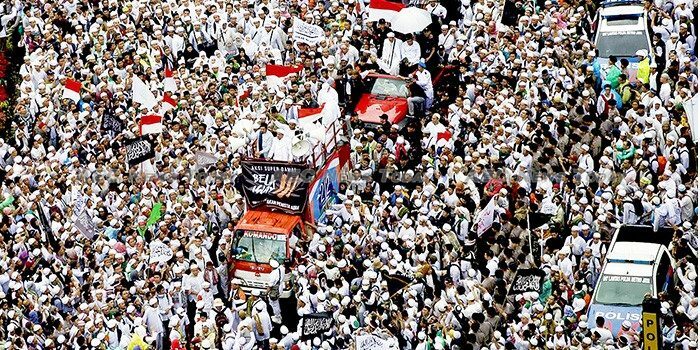 After all, if former general Prabowo Subianto runs again against him, most of civil society will have little choice but to stick with Jokowi, even if they feel betrayed. This all suggests the next two years will be marked by continued pressure on civil society groups and a slide away from the liberal democracy that they thought they had won at the turn of the century. 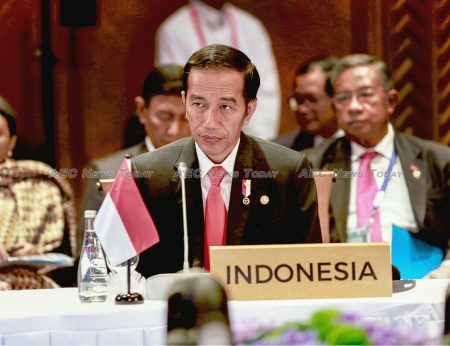 This article is written by Tim Lindsey, a director of the Center for Indonesian Law, Islam and Society at the Melbourne Law School. It appeared on East Asia Forum under a Creative Commons License and is reproduced here with its permission.